Taking over a business that has been established over 20 years ago is not an easy task, but we have kept steady with the well-established philosophy of keeping our prices low and customer service our #1 priority. 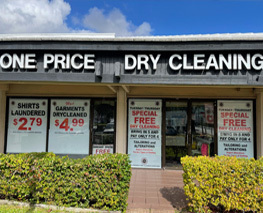 Adding our own touch by taking the dry cleaning business to the next level, we now accept credit cards, established a loyalty program, rush service, in-house tailoring and alterations were added as well. All of our cleaning and specialty services are done in-house by our spotter, who has been in the industry for 30 years. We use Eco-friendly hydro carbon to keep your clothes and the environment safe. Please feel free to provide us with feedback in order to serve you in the future and keep up with the high standards you have become used to seeing from us. Please inquire about delivery area and other services.